I have made a step card for today's inspiration. Take an insert from White Pocket & Flipfold Insert B score & fold it to make a step card. Die cut 2 pieces of white cardstock using both the dies from Sweetheart Borders Die. Glue the thinner diecut to the top edge of the card. 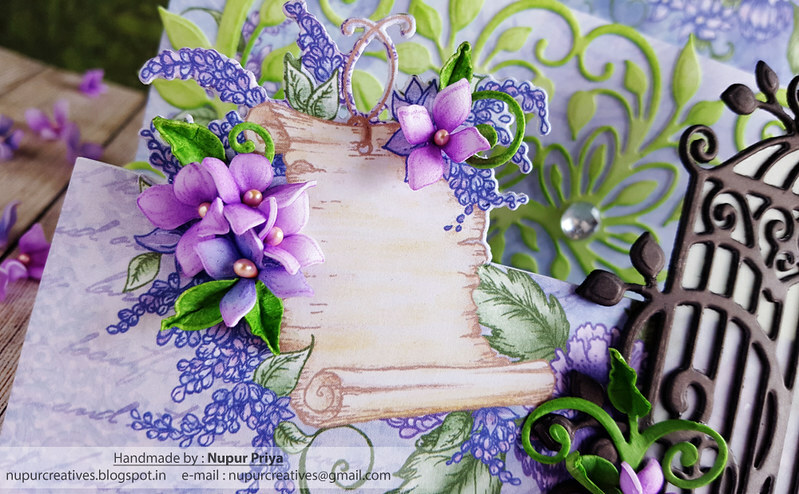 Take Lush Lilac Paper Collection and use it to cover this card. 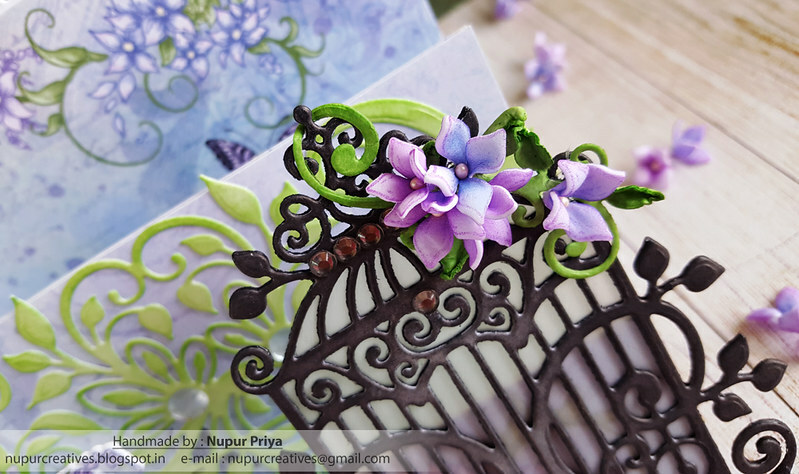 Use the Sweet Lilac Scroll & Cage Die to die cut the top half of scroll image from the pattern paper that goes above the edge of the 1st fold of the card. Die cut a piece of white cardstock using the same die & glue it to the back of the previous die cut pattern paper to give it strength. 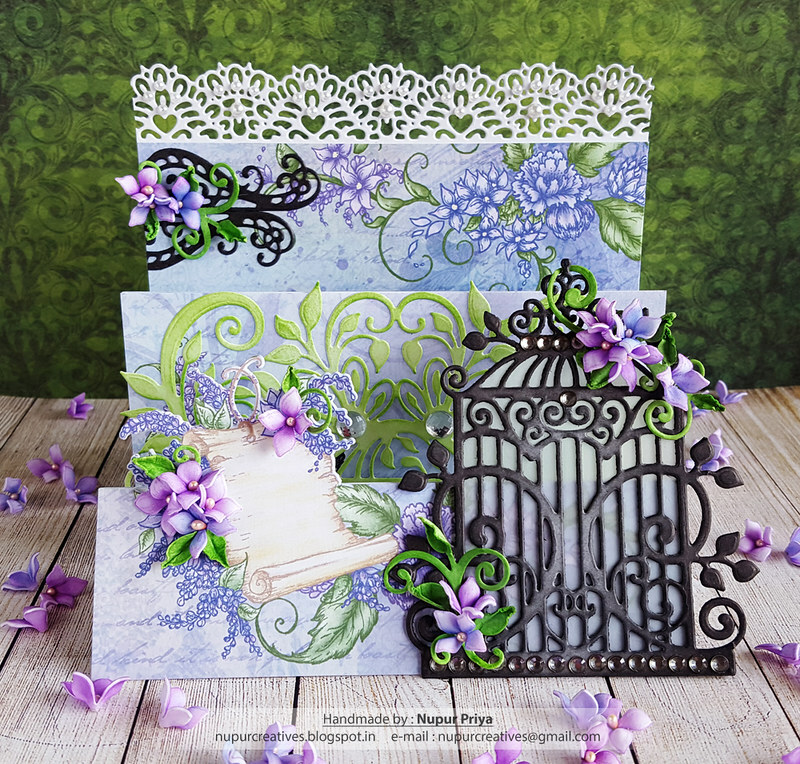 Die cut 2 pieces of black & 1 piece of white cardstock using the cage die from theSweet Lilac Scroll & Cage Die. Fussy cut a piece of vellum to cover the inside of the cage. Ink the white diecut lightly using Jet Black Ranger Archival Ink Pad & Stack and Store Daubers. Glue all the layers together sandwiching the vellum in between & keeping the inked white diecut on top. Adhere it to the front right of the card. Take the second Sweetheart Borders Diecut & ink it lightly with Vivid Chartreuse Ranger Archival Ink Pad using Stack and Store Daubers. Glue this to the second fold of the card as shown. Die cut a piece of white cardstock using Window Box Elements Die & ink it lightly using Jet Black Ranger Archival Ink Pad & Stack and Store Daubers. cut it in half & glue it to the top left side of the last card fold as shown. Die cut few pieces of white cardstock using the leaf dies from Cut Mat Create 1B Die & Cut Mat Create 2A Die. Ink them with Vivid Chartreuse Ranger Archival Ink Pad using Stack and Store Daubers. Shape them using Deluxe Flower Shaping Kit. Arrange & adhere all the flowers and leaves as shown on the card. 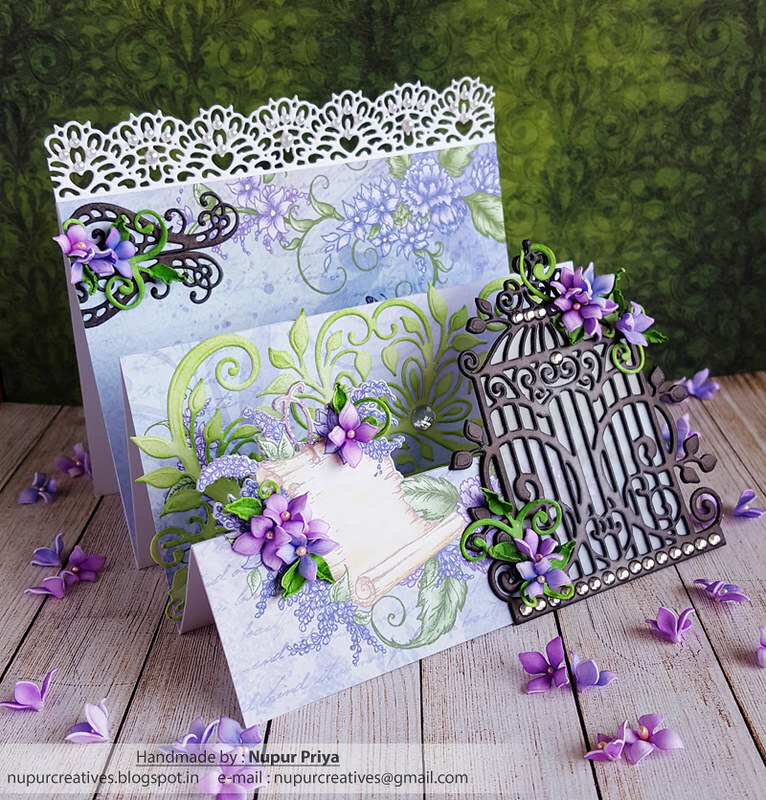 Add some pearls & rhinestones to add finishing touches to the card.